​​Please use the contact form to tell us about yourself and your interest in working with us. WE TRAIN YOU TO BE A PART OF OUR CREW! Minnesota Transportation Museum (MTM) offers internships for current college students and recent graduates. Internship opportunities include museum studies, archival, curation, history, graphic design, hospitality, event planning, and educational program development. A career-building opportunity for college students. Work in a museum. Build your resume. Gain real-world work experience. Network with museum professionals and fellow college students, too. Minnesota Transportation Museum’s College Internship Program offers a one-of-a-kind opportunity for advanced undergraduate and graduate students to work in a cultural organization while building career credentials. Internships with MTM are offered year-round. Interns can apply for fall (September-December), spring (January-May) or summer (June-August) semesters. College and graduate students can apply up to one (1) year after graduation. As a college intern at MTM, you'll add to your resume while you learn first-hand about careers in history and museums. MTM college interns leave the program having completed "real" work in a professional environment, while under the guidance of an expert in their field. College interns make new contacts through working with professional staff, and networking with each other. Interns can inquire at their college about receiving credit for their internship experience. Saturdays between 10-4pm, and Sunday’s between 12-4pm. There will be some additional weekday hours needed between 8am–4pm, Monday thru Friday. Please note: MTM College Internships are considered a learning experience. Most internships are unpaid. Participation in the internship program is not linked to employment opportunities at MTM. If you would like to find out more details about these opportunities, get in touch with us using the form above! Come volunteer at one of the coolest museums around! We're always looking for those who love history and learning! Contact us using the form above to get started! We have always enjoyed the reciprocal benefits of working with higher education programs. We're interested in working with you to develop projects that can benefit college students in their education. At the Museum, we can provide scenarios based on subjects ranging from museum studies, curation, and archival, to marketing, graphic design, and event planning, as well as mechanics, programming, and metalsmithing. Have an idea for a project? We'd love to hear it! Contact us using the form above. Interested in starting a career in the transportation and railroad industry? 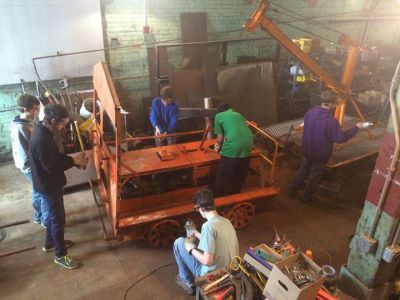 The TCU (Transportation Communications Union) Job Corps are a long time partner of ours and their railroad career students use our facility for valuable hands-on training. Visit their website to learn more about their programs and career training opportunities.